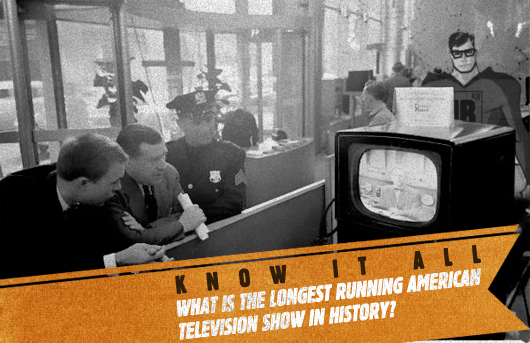 What is the longest running American television show in history? Like so many common knowledge questions, this one is loaded and appropriately has an extremely multi-faceted answer. The information you seek depends on several factors: does “longest-running” refer simply to the number of years between the airdates of the first and final episodes? Or is it a question of the total number of episodes? Further, what is the definition of “a television show”? Does that apply to any program at all? A daily show? Weekly? Talk show? News program? Soap opera? Recurring characters? Scripted sitcom/drama? Animated? Game show? Children’s program? Syndicated? How specific does one need to be, in categorizing? Clearly, there are a lot of variables at play and so, the answer cannot be as succinct as one would hope. However, in the interest of time, I will cover only the major bases. Total years in existence: NBC’s weekly Meet the Press has been on the air longer than any show in history, with nearly 62 years of programming (and counting); the first broadcast took place on November 6, 1947. Honorable mention goes to the CBS Evening News, which started nine months after Meet the Press, making it the second longest-running show of all-time, in terms of years, and the longest-running nightly newscast ever (16,000+ episodes). Total episodes aired: NBC’s daily morning show Today has been on the air since 1952 and has amassed an astounding total of over 20,000 episodes, with no end in sight. Late night variety/talk show: The Tonight Show was unveiled in 1954 and 8300+ episodes later, continues its run on NBC with its fifth host, Conan O’Brien. Scripted comedy: The Simpsons debuted on Fox in late 1989. 20 seasons and 441 episodes later, it’s still going (Season 21 begins Fall 2009). Scripted drama: The western serial Gunsmoke ran on CBS from 1955 to 1975, with 635 episodes on its resume. The original Law & Order will tie this mark as it enters its twentieth season this fall (in terms of total episodes at this point, however, Law & Order still sits over 200 episodes behind Gunsmoke). Scripted comedy, live-action: The Adventures of Ozzie and Harriet entertained audiences for 435 episodes during its immensely successful fourteen-year run on ABC (1952-1966). Why is there this recurring idea that Monday Night RAW is the longest running weekly television show? I just heard them say it before a commercial brake, I look it up, and the only “truth” to it that I can find is a posting on yahoo stating…Monday Night RAW. As an answer to this very question!